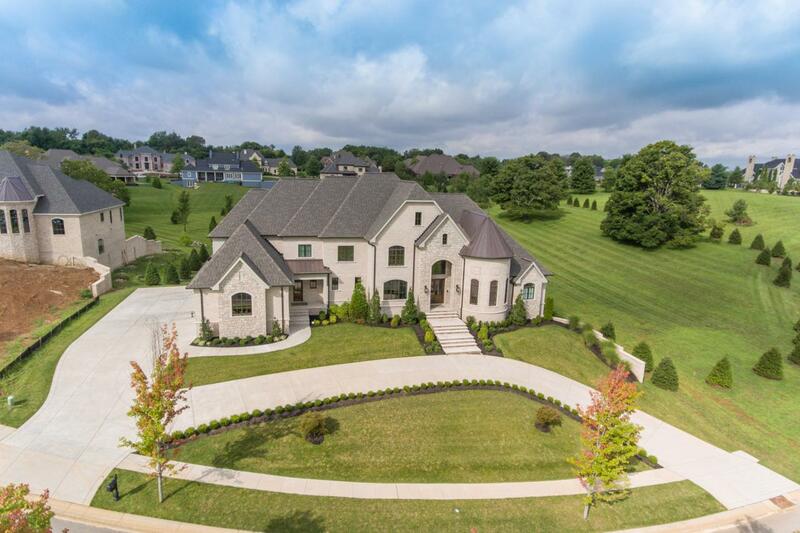 Situated in the rolling acres of one of Louisville's most exclusive neighborhoods, this gorgeous Harrods Glen estate offers a custom-built masterpiece featuring the finest finishes imaginable, completed with a special consideration of today's most luxurious styles and sought after designs. 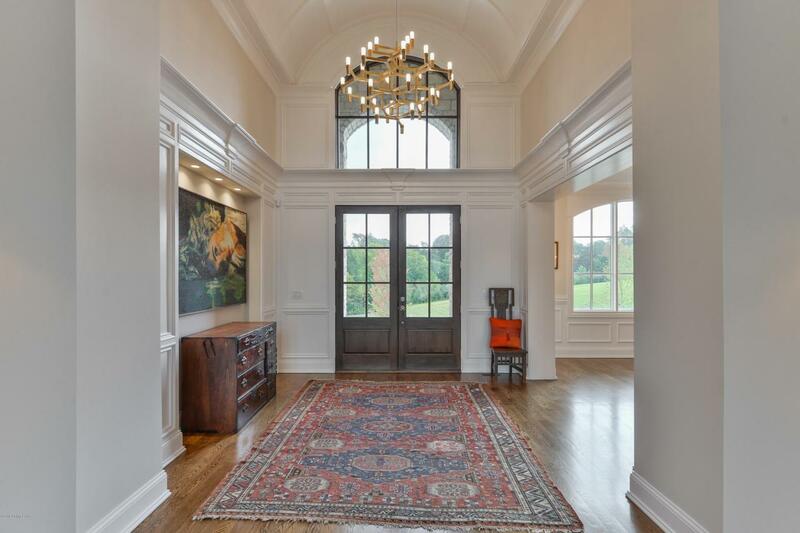 From the breathtaking foyer with barrel vault ceiling and French door entry to the castle-like turret study featuring stunning white paneled walls and bay windows with lattice feature, attention to detail defines this one-of-a-kind home. 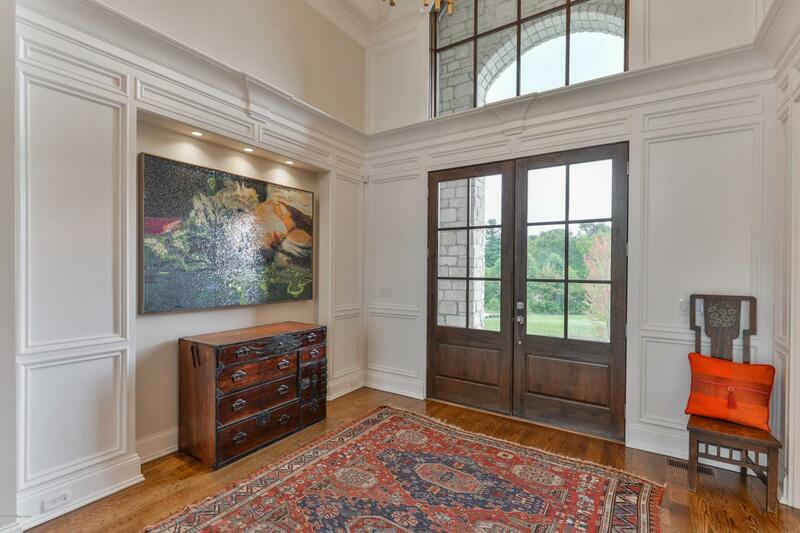 The first floor is comprised of soaring arched doorways, recessed alcoves for art installations, rich hardwood floors and refined millwork throughout. From a formal dining room featuring elegant wainscoting, scenic arched window and elaborate butler's pantry, gueststransition to the two-story great room through an incredible domed hall, immediately greeted by a two-story wall of windows overlooking the scenic lawn beyond and drawing the eye to the stunning coffered ceiling above. The first floor's open floor plan creates communal space between the great room, gourmet eat-in kitchen, dining area and family room, tied together by a shared wet bar featuring columns, glass display shelves and wine cooler. The home folds into the eat-in kitchen featuring sleek white palette, stainless steel appliances, floor-to-ceiling cabinetry, marble countertops and concealed refrigerator and walk-in pantry. Past the kitchen's dining area, the room opens onto the cozy living room with oversize windows before folding into spacious family room with cathedral ceiling and board and batten accent wall. The first floor continues with a spectacular master suite, featuring turret study with half bath, boutique styled his-and-her walk-in closets, designer master bathroom with soaking tub & additional make-up vanity and spacious master bedroom with vaulted tray ceiling. The first floor is complete with a mud room, laundry room, powder room and four-car garage. Accessible by elevator or stairwell, the second floor offers three large bedrooms as well as a second master suite, each featuring walk-in closets and en-suite baths. The second floor is complete with an additional laundry room with added storage space. The walk-out lower level has been designed to mimic a second first floor and was created with a specialized open floor plan to include a gourmet eat-in wet bar, family room, den, playroom and game room, in addition to a powder room and two spacious bedrooms with Jack-and-Jill bath. The outdoor living spaces are as impressive as the interior, featuring oversize entertaining patio, columned covered patio with stone fireplace and wraparound screened-in porch with wood panel vaulted ceiling, outdoor kitchen and stone fireplace and hearth.